A chest is a simple piece of furniture that can be interpreted in many ways. 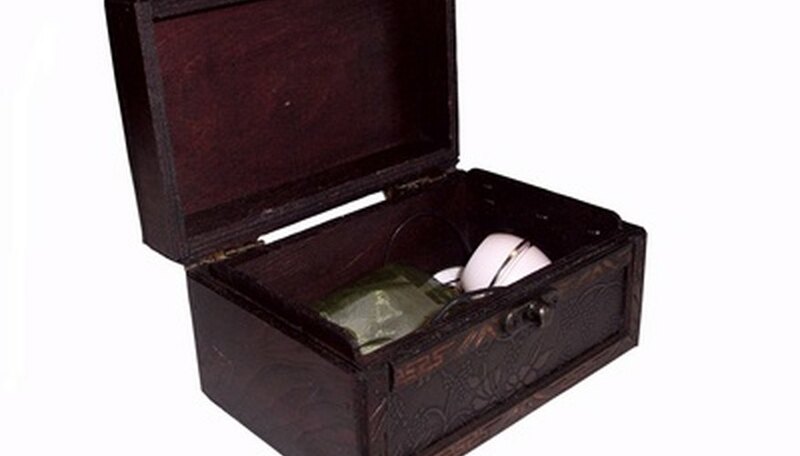 The basic design of a chest is a four-sided box with a hinged or removable lid to cover the contents of the chest. Wooden chests can be found in various conditions, from pristine to well in need of restoration. You can easily restore an old wooden chest to look like new and even regain its natural scent with a little bit of elbow grease. Lay out a plastic sheet underneath the chest to protect the floor during the restoration. You should also cover any items of furniture that cannot be moved away from near the chest. Sand the entire outer and inner surface of the trunk with an orbital sander to remove any gouges, stains or unpleasant finishes on or inside the chest. Clean away rust and dirt from the metal hardware on the chest. Use a wire brush to scrub the parts until they are clean and shiny. Remove decayed or damaged hardware that cannot be cleaned and replace it with new pieces. Try to find hardware that is similar or complimentary to the remaining original hardware. Brush away the dust from the sanding and wipe off any rust particles that may have clung to the hardware after cleaning. Make sure the entire chest is completely clean and free of fibers or particles. Put on your rubber gloves. Mix the stain you want to apply to the chest thoroughly with a wood stirrer. Apply it over the entire chest using a cloth soaked in the stain. Make sure every part of the chest gets saturated with the stain to ensure an even coat. Wipe down all of the stained surfaces using a clean cloth to remove puddles and to spread the stain out more evenly. Use the cloth to level out light spots and to soak up dark spots until the color looks consistent on the entire surface. Apply a rustproof clear coat to the metal parts to help protect them from rust damage. You can change the color of the parts by applying a metal paint before putting on the clear coat. Work on the inside of the box first and then the outside to ensure the outer finish doesn’t sustain any damage. Do not try to restore a chest that has become rotted with mold, as it is unsafe and could make you ill.
Wood Zone: How can I restore the aroma of my cedar chest and cedar lined drawers?